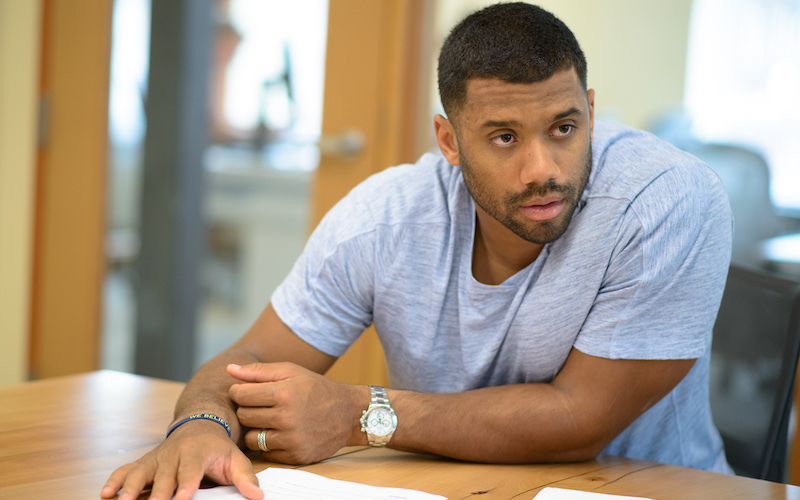 Both on the field and in the boardroom, Russell Wilson is a force to be reckoned with. When he entered the NFL in 2012, he immediately made his presence known, tying legendary quarterback Peyton Manning for most passing touchdowns in a season by a rookie. He constantly exceeded expectations, becoming the shortest quarterback in NFL history to start and win a Super Bowl. Off the field, Wilson has endorsed and invested in a multitude of companies. Most recently, in 2017, Wilson founded a network platform called TraceMe to help connect fans with celebrities. The app collected $9 million in Series A funding with high-profile investors including Jeff Bezos’ Bezos Expeditions, Alibaba co-founder Joe Tsai, and YouTube co-founder Chad Hurley. However, as much success as he has experienced, Wilson is no stranger to failure. Many sports fans will remember his crucial goal line interception that turned the tide of Super Bowl XLIX. Despite the mistake, Wilson kept moving forward, counting the play as a major learning experience. In this exclusive interview, the NFL star recounts his greatest successes and failures, as well as the origins of his TraceMe platform. Innovation & Tech Today: What are your greatest successes? Russell Wilson: Undoubtedly everyone will think that winning Super Bowl XLVIII is my greatest success and it certainly is one of the best moments of my life. But I truly think my absolute greatest success was finding my one true love, marrying her, and starting a family together. I&T Today: On the other hand, what have been some of your greatest failures? RW: I will always have to answer questions about the one-yard line. That was a pivotal play on the greatest stage in sports and will be re-played countless times. Contrary to what most people would believe, I do not see that play as a failure; I see it as a learning opportunity that I will grow from. I see it as another page in the book. Moving on from that play, the important thing I always remember is not to have any fear. Once you let the fear of failure enter your mind, it will distract you from your ultimate goal. I&T Today: What have you learned from these positive and negative experiences? RW: I have failed many times. Without failure there can be no learning process and improvement. Fail or succeed, I always try to keep my mind neutral. Never get too high or low. By staying grounded and not forgetting what is most important, my mind remains clear in the most stressful situations. I have learned that consistency is key, and that the best way to separate yourself from the competition is through preparation. Separation is in the preparation. I&T Today: Could you talk about how tech is incorporated into your football training? RW: Tech plays a vital role in my training physically and mentally. Physically, during the season and out of season my performance team traces my performance goals and measures my daily recovery. Mentally, I am constantly studying film, my playbook, and also enhancing my mind through the power of technology. My goal each week is to have a limitless mind. I want to feel unlimited. I&T Today: Could you tell us about TraceMe? RW: I started TraceMe just over a year ago with a simple mission: how do we connect fans in a deeper way with the people that inspire them? I’ve been blessed to be under the spotlight for some time now and it’s always been incredibly special every time I have the opportunity to connect with fans. I realized that there wasn’t a platform that allowed me the opportunity to give them more – dive deeper into my life, my interests, and my passions. TraceMe gives the celebrity, entertainer, or athlete the ability to create with no limitations. We’re a free app on iOS and Android; when you download TraceMe you’ll see that you can dive into several different uniquely branded worlds. There’s the Russell Wilson, Ciara, Alvin Kamara, and QB2QB worlds with many more in the pipeline. In each world, we give you behind-the-scenes access in a way that hasn’t been done before – bringing fans up close into our lives. There are 7.5 billion people in the world and I believe every one of them is a fan of something. One day, TraceMe is where they will go to connect them to those things they love. I&T Today: What’s next for TraceMe? RW: This is going to be big summer for TraceMe. We’re adding more celebrities to the platform as well as a number of great features that will bring the fans even closer to the celebrities they love. This interview originally appeared in the Summer 2018 issue of Innovation & Tech Today. To see the full, digital magazine, click here.